Albert Gray was born about 1879 in Marston, where his father George was a farm labourer. In 1901 (age about 22) Albert was in London, working as a footman at 41 Cadogan Place, Belgravia. In about 1908 he married Elizabeth (probably Elizabeth Woof). She’d been born in Creetown, Kirckudbrichshire and may have met Albert through John Woof, a valet at Cadogan Place. They set up home at 10 Park Road, Grantham where they had a daughter, Sallie later that year. Albert worked as an agent for Prudential Insurance. During WW1 conscription was introduced for single men aged 18-41 in Jan 1916 and extended to married men in May. In Sep 1916 Albert (aged about 37) was granted a 2 month exemption by the Grantham Tribunal, but refused him exemption at its meeting on 8th Dec. He joined 2nd/7th Battalion, The Manchester Regiment. The battalion arrived in France at the end of Feb 1917 (he may have joined them there after training). Initially they were in a relatively quiet sector near the coast in Flanders but at the end of Sep 1917 they moved south to take part in the Third Ypres campaign. On 27 and 28th Sep their 66th (2nd East Lancashire) Division moved into the tent city at Vlamertinghe just west of Ypres, before taking over the line in the vicinity of Tyne Cot. 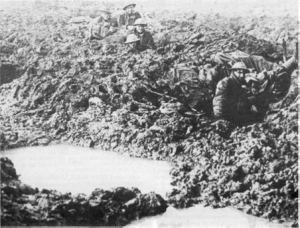 The 66th and 49th (West Riding) Divisions were earmarked for a key assault on the ridge at Passchendaele, in what became known as the Battle of Poelcapelle (6-10 Oct 1917). The 2nd/7th Manchesters were part of 199th Brigade, which moved into the front line on 5th Oct. The assault was due to start at 5.20am on 9th Oct, with 197thand 198th brigades attacking and the 199th staying in the front line as reserve. On the night of the 8th Oct, 10 hours before the attack, the 2 other brigades set out to march the 2½ miles to the front. But the drainage in the area had been destroyed and it had been raining heavily since 4th, so the low-lying area had become a swamp. Each brigade only to advance along a single duckboard track and these petered out 1 ½ miles short of the front. They were heavily shelled all the way and kept stopping to try to save men who’d been blown off the track. By midnight they were so far behind schedule they were ordered not to stop for any reason, leaving the injured to drown in the mud. The 197th arrived late, exhausted and disorganized, so 2/7 Manchesters were suddenly ordered into the attack. They pushed their way into the cemetery next to Tyne Cot, clearing the area and capturing 19 prisoners. But hostile artillery fire prevented them from pushing further forward. By midday the remainder of 197 Brigade had arrived and finally reached Passchendaele village. On the left the 198th brigade started on time but was held up by shell and machine gun fire and mud up to 6ft deep. The 197th became exposed at Passchendaele. Orders for some elements to fall back to keep touch with the neighbouring units was misinterpreted as a general withdrawal and the brigade ended the day positions just past their first objective line. Private Gray died at some point in this confusion. In November he was reported as wounded, by December he was reported as wounded and missing. It wasn’t until Mar 1918 that he was confirmed as having died on or soon after 8 Oct. His body was never identified and he is one 35,000 men listed on the memorial at Tyne Cot. His name is also on the war memorials at Marston and St Wulthrams, Grantham.